It has been eleven years since that dark, cold morning. Today, for the first time in the eleven years, I didn’t go to the park to light a candle on the morning of January 17th. It is not that I finally forgot about the Great Hanshin Awaji Earthquake. 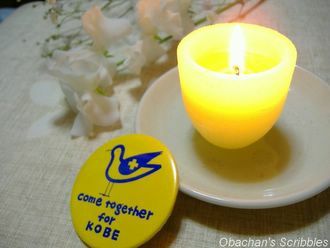 Honestly, after moving back to Kochi, it got harder every year for me to feel the emotional distance between the people in Kochi – who did not actually experience “that morning” – and me at the candle-light memorial service in Chuo Koen. So I decided to send a prayer alone in my room from this year on. Just a few minutes before 5:46 AM this morning, I lit a candle. This “can badge” was something they made (for a fundraising purpose, I guess) in Hyogo pref. a few years after the earthquake. I felt like taking it out this morning. Also I bought a white sweet pea like I did every year for my personal ritual. Some of you readers might have noticed that I haven’t updated my “A Frozen Clock” blog for about a year after a few entries. Of course it is NOT because I finished writing everything I wanted to. I just couldn’t go on. Writing about the initial fears was not so difficult. But what hurt me the most in that earthquake was "people factors," and it was much harder to put them into words. In that chaos after that earthquake, I experienced real anger or rage for the first time in my life, and ten or eleven years is not enough to erase it. No, I don’t think that kind of anger can ever be “erased” like it didn’t happen at all —it can only be “processed” so that I can move forward from there, and that was the biggest reason why I started that blog. We are expecting a major earthquake and tsunami to hit Kochi in the near future. It is said that most of the residential areas will sink under the water, leaving the top of Kochi castle only showing above the water at least for certain period of time. That’s part of the reason why I’m trying to introduce our life in Kochi on my blogs this way… I want to leave it in the cyberspace before it is destroyed. By the same token, I wanted to leave in the cyberspace a description of a woman’s ugly struggles to “process” the anger…because I thought some people might feel related to it. It’s harder than I had thought, but I guess I’ll probably work on it little by little. After all, I’m trying to see the task as the reason why I survived that earthquake while so many – too many – people with more talents, bright futures, dreams and hopes just had to die around me then. My candle is a part of them. I was trained in Western psychology, and I would like to tell the whole world that we are not lighting candles every year on January 17th just because we are all stuck in a certain point of grief process. To me, we are lighting the candles for the sake of a continuum that is very future-oriented. I can’t speak for everybody, but I light a candle to affirm ourselves. I light a candle to remember and accept how scared, brave, heroic, sad, coward, ugly, self-centered, immature, loving, generous and angry --- just how human we were. I light a candle to remember that we did survive in the past, and will survive in the future, too, and keep telling the world that we can. I light a candle to remember the lesson we had to learn through such a great loss. I light a candle to support all the efforts to go on the grief process, and share the courage and strength to let it take as long as it needs to take. I light a candle to support and care about the people dealing with the issues that get harder as time goes by. Those include things from talking about unresolved issues from the earthquake to getting financial supports for earthquake-related projects. I light a candle to trust that we can remember and make things better in the future. I light a candle to remind myself how precious life is and ask myself how fully I'm living my life. I light a candle for hope and to be able to keep hoping. If the candles were blown out, we will light them again. And again and again. Even if people stop having those memorial events in various places, we’ll keep lighting the candles IN OUR HEARTS. How difficult. Sometimes one is affected in one's life by circumstances beyond one's control. I have known situations that have gone wrong when events have been in some ones else's control and that has brought on anger, becoming rage. There are other times that nature has done things that I would be angry at if I could only find something to blame. I can't find the forces of nature to be at fault and I can't find the failure of well-intentioned people (no matter how stupid they prove to be) at blame for it either. Unless you work to support stupid, you will get stupid results. Make emergency things simple. Despite TV shows, most people are not at their brightest or best during an emergency. Grief has anger as part of its definition and anger is part of the process of grieving. Eventually, one moves on with life, as simply as turning the page of a book. And that is as it should be. Let your candle blow out, just see to it that there are some revisions in your earthquake response laws on the books. Thank you for your comment. I really appreciate that you took time to relate to what I’m going through. To be honest, I had this strange feeling that you decided what I must be mad at for me instead of me, though. Perhaps what the candle light means to us is a little different from what you think it means to us. My candle is part of all these candles. I had a funny feeling upon reading this post. My grandma and my father are old enough to have had a taste of hardship in wartime. They would be in such a rage whenever this topic is brought into conversation. Eventhough not openly expressed, my dad gave me the impression that he hated and resented his life. Ironically, they are also the ones who are more devoted in giving credit to the Providence. (By Providence, I make no reference to God. In kanji, it is 天) They would always tell us to be grateful to the Providence, for without whom, we won't be in existence at all. Since childhood, I have been very curious why they had to say so. I mean, they are the ones who had escaped calamity by a hair's breadth, through courage and will to live. By all measure, they should be the ones who should receive all the credits. And yet, they gave all the credits to the Providence. Even more confusingly, my dad told me once that his life is a wasted life, so the next generation should take the opportunity of a peaceful time to advance themselves as much as possible. One would think that a person who had gone through difficulties should understand better how many wonderful things a peaceful time could offer. But he actually puts his hope on the next generation. Talking about this always makes my eyes wet and feel all the more undeserving of whatever I have now. I think you deserve what you have now, kelken, no matter how your parents view their lives. This anniversary reminds me not only of the earthquake, but that I found your blog about this same time last year and it has been such a pleasure reading your entries and looking at the beautiful photos. Memories serve us in so many ways and I hope that your memories have softened a bit and that they don't cause you too much heartache. Stay strong. Thanks for always being there with me. I'm worried if you don't like to recieve a comment in Japanese. > And I feel those two are basically talking about the same thing in just different ways. Comments in Japanese are perfectly OK here. Thank you so much for sharing your thought. Honestly, I never expected anyone to feel the same way about this, so your comment really meant so much to me. At least, there’s one person who understands ---- I’m not alone. ありがとうございます。And sorry that it took a while for me to respond.